When I was student teaching, one of my favorite parts of the 4th grade classroom I was in was the student name posters that adorned the classroom walls. I loved that the students helped create the decor for the classroom and they added a lot of color and personalization to the space! Every year since then I write out my students’ names on narrow posters for them to color the first day of school. We then hang them up and keep them on our classroom walls all year! To make their name posters, I start off with white and black sheets of 12×18 construction paper. The black papers I cut in half lengthwise (I use these pieces to back the white pieces before I put them up on the wall). Since the white pieces need to be smaller than the black ones, I cut the white pieces so that they are 11in x 17.5 in. 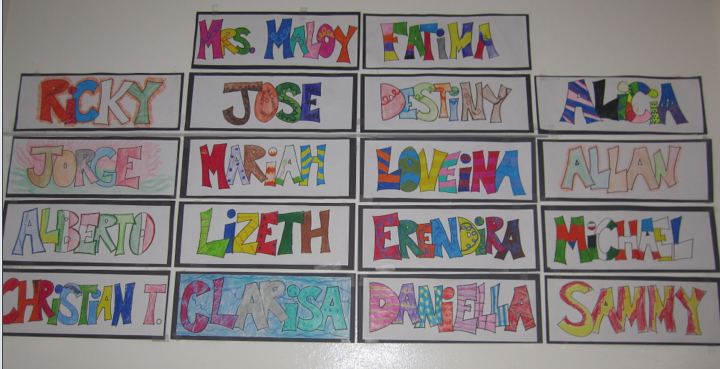 Then I just hand-draw my students’ names with a Sharpie and they are ready to go! When I have my students color these on the first day of school, we talk about power coloring (which I also got from Katie)! Sometimes students have the tendency to draw really lightly with colored pencils, which looks nice up close, but from far away it can be hard to see! I show them how to “power color” by pressing down hard with their color pencils and the difference that it makes. I refer to power coloring many times throughout the year when we are using colored pencils, so this is great practice! My kiddos color these on the first day of school, and then I keep them up all year long! I tell them that it is not just my classroom, but all of ours, and they love having all their names proudly displayed in the room! I'm totally using this idea for my class this year! I love how you tie it in with that the classroom is everyone's, which would be a good community building lesson! Now I just have to wait for my class list! Super cute! Last year I did something very similar to this, but yours look WAY cuter! I will definitely have to borrow your "Power Coloring" idea!! Thank you for the awesome idea! Thanks for sharing! Gained a few new ideas! Come on over and check out my giveaways! I totally wish I had your handwriting! I think my handwriting is very good and consistent but it isn't fun!! Love this. I do the same idea but I use word art in microsoft Word. There are also some cute free fonts on Google that you can download. Thanks. … I was wondering how I could create this!!! I love those!! I agree with Jill, your handwriting is great! This is a great idea! I love making the students more involved with classroom displays. Thanks for sharing! I do something very similar in my classroom. The kids absolutely LOVE decorating their names and seeing them up all year long! This is awesome!!! I will definitely be doing this. I love having kids make things that will be up all year rather than me doing it! Cute idea! I need you to come to my classroom and draw my students' names!! That's so cute! Can you explain power coloring a bit more? Does it wear the pencils out quickly or is ther more of a technique to it? I love this! I did it one year in my classroom…. :) For those of you who don't have neat handwriting, you can create them on MS Word using Word Art. That's what I did. I think I might do this again this year and use smaller paper since I will have around 70 kiddos (3 blocks). I love the idea of them taking ownership in the classroom too…:) Thanks for sharing! I love this activity, but totally could never draw those names! Do you know if there is a font out there that I could use that would look similar? Then I could just type them and print them out. Try checking out Kevin and Amanda fonts… They have lots of great ones and you may be able to find one that is similar for the kids to color in! Thank you Molly for recommending some fonts! I'd love to type my students names. I love your sample! Hugs!!! Absolutely love this!!! Will be doing this. Thanks for sharing! Hi Molly! I just found your blog through some blog stalking and am so glad I found you! Your classroom design is amazing! I am a second grade teacher from Ohio and just starting blogging this summer. Can't wait to read more on your blog! you're such a great teacher! You have so many great ideas! I love this idea. My students always do a picture of themselves which includes their family, what they like and don't like, and what they want to be when they grow up. We save these and put them in their writing book at the end of the year. I'm trying to picture how I can do both, using their names to display their work throughout the year. If only I had more wall space. How weird!!! Although when I just tried to look on my phone they aren't showing up for me anymore! I'll check it out when I get home and if I can't fix it I can email you the pictures if you would like! I don't know what happened! Hopefully I can fix it tonight!! They are showing up now! How cool!!!!! Thanks! These are super cute and SO easy! I am definitely doing this activity this year. Thanks for sharing! Pinning! Great idea!! I think I'll use this to post outside my classroom and display their work under it. Your names look beautiful! Thanks for sharing your creativity and inspiring ideas! This is an outstanding idea. Thanks for sharing. Adorable idea! I just need a font, and I found a pretty close one! If you use all uppercase letters, it is really similar, with the overlapping! You are definitely an artist, As I was reading your article, I was really searching for the font you use, because it is adorable. I am going to check out Christina's font. I also teach my students that their names are a gift from their parents and I’m trying to spread the word of the importance of pronouncing their names correctly (https://www.mynamemyidentity.org/).